>Last Thursday I was sitting at my desk when one of the frequent Hancher emails popped into my inbox. On this day I decided to scan it before sending to my trash can, and the name Roseanne Cash caught my eye. I am not really “in to” music of any kind myself. I listen to lots of different things, but I haven’t been to a concert in years and it generally isn’t something that appeals to me enough to be worth the cost, but…my mom LOVES Roseanne Cash. So we bought 5 of the very last tickets available to a show that was held last night, and my mom, my sisters and I had dinner and an evening with Roseanne Cash’s list. When the lights went down and Roseanne Cash graced the stage with her presence and then her strong and beautiful voice, I was swept back in time. I felt myself sitting on the gold carpet of the house in Tabor in front of mom’s prized stereo. Roseanne started right in with songs from her latest album, “The list” which consists of 12 of the 100 essential country songs that her father had mandated that she learn, in order to know her musical genealogy. The songs weren’t familiar, but the sound of her voice felt like a warm memory of a time when my own mom was teaching us the love of music. The entire evening felt like a reunion with my childhood, a reunion with my family as I sat in line with the women who most influence me, and the love between Roseanne and her father permeated the air in the small theater. After several songs from “The List” Roseanne stopped to talk about her own daughter, and wondered if she were ever to make a list for her future child, would she include any of her mother’s songs? With that, the familiar tune to “Seven Year Ache” began to play and once again, the overwhelming memories of singing and dancing to that very song with my mom in our little farm house in Tabor came over me. There is something so surreal about sitting at a concert with your grown sisters and mother, who is now a grandmother; listening to a performer pour out her heart and soul into a performance inspired by her own father. The memories, the love, the legacy. An amazing night. 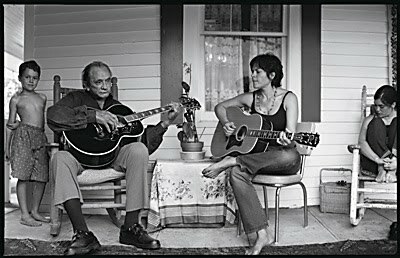 This picture projected over the stage while Roseanne performed her final song of he night displayed the loving tutelage between Roseanne Cash and her father. That song was written by Porter Wagner and is titled, A Satisfied Mind. Tonight I held my baby girl Thea on my hip and danced in the kitchen like my Mom used to do while Roseanne Cash sang Tennessee Flat Top Box over my laptop speakers, a song written by Johnny Cash; and for a few minutes I didn’t have a worry in the world, but a satisfied mind. >In a little cabaret, in a south texas border town sat a boy and his guitar…and the people came from all around… Glad you had a nice evening. I Can just picture you dancing with Thea around your kitchen. Great memories in the making right there! Awesome!